Just before Denny was born his mother was in college, majoring in Music and studying Classical Voice, prerequisite to a classical singing future. In those days it was rather common for households to have a piano and Denny's was no exception. By the age of 4 Denny had learned popular and simple melodies from extended family members and friends. His father joined the Air Force at that time and his family moved their residence regularly. By age 6 he could pick out melodies by ear, and was especially fond of Boogie Woogie piano. Denny took piano lessons for a year when he was 10 years old. To no avail, his piano teacher encouraged him to pay as much attention to Classical studies as he did Boogie Woogie. His family moved to Germany where Santa Claus brought him his first guitar when he was 11. Having done remarkably well with his first small acoustic guitar, Santa brought him a Framus Les Paul style electric guitar the next Christmas. Denny's father was a Country Music fan and Denny liked it very much too. Denny was also taking Classical Guitar lessons from a German Master, and learning Rock and Roll to satisfy the Boogie Woogie in his blood. Denny would explore around the Air Force base to find people who played guitar in any style. Within several months of receiving his electric guitar, Denny was playing in a Rock and Roll and Rock'a Billy band with several Air Force G.I. 's, performing at local teen events and G.I. clubs. The band backed up several acclaimed Artists including Jimmy Dickens and Elvis Presley. Denny's family moved to Texas when he was 14. By that time he was able to quickly learn any kind of popular Music and found many opportunities to play Folk, Country and Rock and Roll Music. He began teaching guitar the year he arrived in Texas ...in the same dusty old building that was once the hotel and commercial building that Robert Johnson recorded in by most accounts, though Denny did not know it at the time. There were still abandoned remnants of the recording studio in some of the old empty and dusty rooms, which Denny explored and touched often, wondering who and how many people must have recorded there in it's dusty past. Between the age of 14 and 16 Denny found himself playing mostly Country Music around South Texas ...although with a strong Rock'a Billy style. At 14 he won a local radio station talent contest that provided a performing spot on the traveling Grand Ole Opry. That opportunity opened several doors including spots in the local House Band for the traveling Grand Ole Opry and other acclaimed Artists shows. Playing in local Country Music circuits, Denny played and became friends with many locally and nationally acclaimed and local grass roots Artists such as Bill Frazier, Adolph Hofner, Jimmy Martin, Shell Price, George Chambers, Johnny Lee, Johnny (Engleburt) Williams, Arkie "Blue", Roy Cleburn, Waylon Jennings, Ray Price and Willie Nelson to name a few. Ray Price had a barbeque bar just south of San Antonio where many Musicians frequented on Sunday jam sessions, and Denny played in the "house band" there frequently, as well as a similar scene at Flores Store in Helotes just west of San Antonio. As Denny's interests moved more toward the British Rock invasion, he was still consulted by Rock Musicians interested in Country Music crossover. It was one of those consults that resulted in Leon Russel meeting Willie Nelson and his early Outlaw circle of musicians at Flores Store on a Sunday afternoon Jam. Before Blues gained the popularity it has today; still a minor, Denny frequently snuck into adults-only Blues venues to hear and learn Blues music; And took every opportunity to play Rock and Roll and Blues. Subsequently, he got the chances to perform casually with such notables as Lightnin Hopkins, Gatemouth Brown, Bobby Bland and BB King. Like many Musicians that didn't know any better at that time, Denny wrote and recorded a few minor Country style songs under For Hire and psuedonym agreements up until the mid 1960's. He was nominated for the Rock-a-Billy hall of fame, for his early guitar style influence / recognition (and his very young appearance likely a factor) by central Texas country musicians of that period. BMI lists his other song contributions. THE OUTCASTS; "Music from the outer limits"
In 1963 the British Music Invasion first entered American Music, and Denny and several friends decided to form a Rock and Roll band and follow suit. They named the band The Outcasts, and painted it on the back of long-sleeve white shirts as "uniforms". They spent most of their first year playing for very low pay if any at as many local teen gatherings as they could arrange. What was supposed to be their first paying job turned out to be some college guys' snake-in-the-grass prank, as the Outcasts discovered after a late at night 3 hour drive to La Grange, Texas which included having to wake-up an out-in-the-boonies gas station operator from his out-in-back apartment because they had all ran low on gas ... in an area in the Texas boonies where even the crickets went to bed before 9:00 PM. When they arrived at the supposed venue as directed and at the appointed time of mid-night, they knocked at the back door and were met by a kind middle aged Lady who invited them to the kitchen table for fresh cookies and punch ...kindly complementing them on their mighty-fine uniform shirts ...and informed them that a not-uncommon prank had led them there to The Chicken Ranch (THE famous house of accommodating Working Ladies). After a year of playing hay-rides, sock hops, teen parties and such, The Outcasts took on a manager Sally Senter, a guitarist-singer Jim Carsten and bass guitarist-singer Jim Ryan. They immediately started expanding their territory, playing mostly military clubs and town music halls in the southern half of Texas. At the same time they started playing commercial teen club venues and quickly gained popularity and notice in South Texas. "Battle of the Bands" became a popular concert format across the U.S. 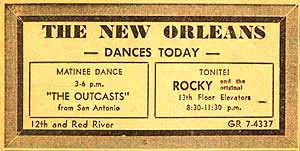 The Outcasts played those concerts in South Texas and usually placed first but occasionally second. Integral to the rapidly growing Rock and Roll scene was Radio and TV Stations' involvement which afforded bands air-time exposure, either by live or recorded performances. Having become close friends and associates of Disc Jockeys and Program Directors through the promotions of their personal manager Sally Senter, The Outcasts' popularity expanded rapidly by their presence on Radio and Television. In late 1964 The Outcasts were chosen to provide the music support for a military show comprised of 3 famous Musicians and Actors going through military entry training at a local military base. In that show The Outcasts were exposed to the professional aspects of the entertainment business through the notable Artists Jimmy Carlson (New York Folk scene), Jimmy Hawkins (Hollywood co-star "Scotty") and Mike Post (Alley Oop, TV and Movie Music producer). At that time The Outcasts hired a new manager Maj. (now Col. ret.) John Carson ... the father of Buddy, the Keyboardist / Singer. Not until 37 years later did the surviving Outcasts learn about the remarkable biography of Col. John Carson and his brother Eugene. Mike Post is best known for his stints with the Hollywood Argyles (Alley Oop), Elvis Presly movies, and as a Movie and Television Music Producer. Mike particularly befriended The Outcasts and took them under his wing to teach them the recording business and record 2 of his songs "Nothing Ever Comes Easy" and "Oriental Express". The combination of that influence polished The Outcasts' act and gave them even more Media exposure from the recordings, further expanding their horizons and popularity. By late 1965 The Outcasts were the top local band on radio, television, concerts, venues and the Rock and Roll music scene in south Texas. In 1965 The Outcasts were also invited to play The Beatles concert in Houston Texas; But The Outcasts management, not fully understanding the importance, determined in the best of good faith that they could not afford the insurance requirements and turned down the invitation. The Five Americans took the slot and the international fame it afforded. additional song recordings, some of which received national attention, and some that Denny wrote in collaboration with others in the band. But The Outcasts did not have national management and such management did not discover their talent and efforts; And the still teen-aged Outcasts simply could not handle the volume, velocity and abstract of their success. Beside "having the world by the tail", the atmosphere also presented considerable dangers. Denny left the band in September 1966 to become an Army pilot ....which proved to be somewhat less dangerous! He was replaced by an excellent guitarist singer who collaborated with the bass player to produce the most acclaimed song of The Outcasts short fame, "1563 Blair" backed by the cover "Smokestack Lightening", a record that helped greatly to establish The Outcasts in the archives of Rock and Roll as early innovators of and contributors to Rave and Psychedelic Music. "1563 Blair" is recognized by critics as a classic and notable piece of Psychedelia. Some archival references to their contributing to Punk Rock is due to some early Punk bands playing and recording Outcast songs, notably The Fuzztones. Outcast Buddy Carson died of hepatitis in 1968. Ricky died in a car accident in 2000. Jim Carsten entered law enforcement, became a county sheriff, and is now a security consultant. Jim Ryan became an educator and is a successful public school teacher of music, a songwriter and manages his own music production company. Denny is a retired airline pilot, a multi-media artist and teaches music and merchandises and repairs guitars in his home studio and shop. Both Jim Ryan and Denny still perform and record music. archive recording companies over the years and an entire CD, "I'm in Pittsburgh", produced with all but one record in their discography. The Outcasts are listed in archival books, notably "Fuzz, Acid and Flowers" and "The Great Psychedelic Discography"; And mentioned on several archival websites. Denny continued to play and study Music the 5 years he was in the Army. While stationed in Arizona he played with the house band at the famous Crystal Palace Saloon in Tombstone, over which Doc Holiday and Wyatt Earp had their offices in the days of the OK Corral. During Flight School he hid his guitar in the attic of the barracks where he and other trainees would go play at night. Denny sometimes took his guitar with him while flying helicopters in combat in vietnam, and would play and practice sitting in the back of the helicopter during breaks between missions. A Commanding Officer and big fan of Country Music heard Denny and teamed him up with other G.I. Musicians stationed nearby, and they played Country Music in local Officers and NCO clubs in vietnam on their off-days carefully scheduled by that C.O. who would not take "can't" as an answer. That C.O. once dispatched one of his heavy-lift helicopters to Saigon which returned with more than enough musical equipment for their show. Such was vietnam besides being a war, not unlike the movies "Air America" and "Kelly's Hero's". Not many things more psychedelic than an army of rampant alcohol and drug abusers coping with a ludicrous war. Upon returning from vietnam in 1969 Denny continued to play as opportunities would arise. His strong opinions against the war kept him much at odds with the Army, and his last 2 years were challenging. He once got into a bit of trouble when he was directed to but could not appropriately attend an important, official, Officers introduction party for a New Commanding Officer ...but was discovered playing in the costumed Rock and Roll band booked for the party. His reply to his less than pleased Commander was "Ma'am, I had two obligations, and I met both." During that period he also experimented allot with abstract psychedelic jazz ...which would later become popular as Fusion, and started studying classic Jazz. He also played occasionally with Country Bands at Panther Hall outside Fort Worth, which was the area's premier Country Music Hall at that time. When he left the Army in 1971 his music life waned for about 3 years as he contemplated and recovered from his sometimes difficult Army experiences. circuits of the Southeast. Taking another break from music in 1979, he bought an 18 wheel truck and set out with his girlfriend and now wife to see the whole United States prerequisite to moving to a Pacific Island in 1981 where he resides today. He started playing music there right away. In 1983 he started flying airplanes again and retired from that career in 1996. In 1992-93 he studied Hawaiian Steel Guitar for a year under Jerry Byrd, the Father of electric Steel Guitar and the World's foremost non-pedal Steel Guitarist. In 1998 Denny returned to college in a commercial music program to brush up on the latest Music developments and graduated with a 99 grade point average. Coming full circle, he is now devoted to music again full time. In his studio he teaches guitar, steel guitar, bass and music theory, provides consult and merchandises guitars and their supplies. He also repairs and restores guitars in his shop, and has a visual and website arts studio. He still plays as often as casual opportunities arise, mostly Blues based Rock and Boogie Woogie ....but always with some Avant Garde and Country songs to round out a good night of American Music ....with knowledge, experience, talent, heart, soul and allot of salt and pepper. who gave his life in the same Excellence of Duty and Character. OK, I WROTE IT; NOW PAY ME. C.L.